That these big heids just hadnae got a clue”. One line from Oliver Goldsmith’s poem above has always seemed to me to apply to people with pretensions. While Goldsmith wrote “That one small head could carry all they knew” is not appropriate, I have substituted my own take on things. The populace are definitely wondering at the public mess our Westminster government is making. There seems to be no ending, or any progress, in sight for Brexit. As I write, the SNP have tabled a motion to revoke Article 50, which has received over 6 million signatures, but it is early days. Westminster is in an “indicatory” mood, since they cannot reach a definite position, so it is “How do you like this?”, followed ad infinitum by “Well, how do you like that?” until they reach an agreement; so far things have been up and down a bit – to put it mildly. However Mrs May is determined to bankrupt Britain, as her party is in general wealthy and will not miss a million or two – and de’il tak the less fortunate, who don’t vote Tory anyway. This point has now passed, so no progress yet. 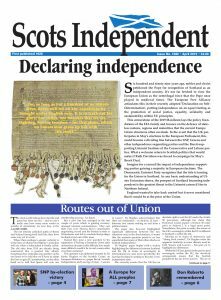 I must say I am pleased by the SNP, who have been consistently speaking up for Scotland; there is no chart in these waters and we will not get everything right, whereas the Tories are getting everything wrong, the fact that they want Boris Johnston as Prime Minister is proof positive of that. Latterly I have been thinking of Her Majesty. The tradition in this non constitutional world is that a resolution does not become law until it has the Royal Assent. Not so long ago there was a BBC play called “King Charlie III”; this was set in a theoretical future world, where Prince Charles inherits the throne from his mother but does not like what the politicians are doing so refuses Assent – result constitutional chaos! However, that is in the theoretical future – we are dealing with the here and now. As far as I can ascertain the last time Royal Assent was refused was in 1707, by Queen Anne; the occasion was something to with a Scottish Militia; the timing and the occasion are perhaps symbolic; it was just after the Treaty of Union had been agreed, and it was a Scottish militia – whenever I have an odd hour to spare I will dig in to that, but not yet. Leaving aside Prince Charles and his eclectic ways, consider the current Queen. She must be well aware of the chaos and depredation coming down like an unstoppable express train, and of the hurt and hunger approaching her subjects, for the gratification of the wealthy few, and wondering how she could help? Well, consider this – politicians of both Tory and Labour are afraid to take definitive action as whatever they do will cost them votes, so political instincts are prey to personal desires – oppose and lose votes, support and lose votes – there is no middle way – the political stupidity of the then Prime Minister, David Cameron, attempting to solve Tory Party splits has rebounded in massive fashion and has resulted in further splits and a reluctance from anyone to change their views. The Queen does not lose any votes, because she is above any democratic rule; if she decided that “Le Roi dit Non!” there can be no sanctions imposed, because Royalty is supreme and overrides the law. She could stop this nonsense; Westminster pays lip service to the “constitutional” niceties , with their quotes about Henry VIII – who was never King of Scotland, although his predecessors kept trying. It is of interest that the first joint King of England and Scotland was a Scot, Jamie Saxt, son of Mary Queen of Scots, executed by her cousin, Elizabeth – a bloody means of solving a royal problem. Whatever, for the first time in history the Queen has the chance to provide succour to her hard pressed subjects, as all democratic paths have failed. I realise that as one with Republican tendencies it is strange for me to advocate a Royal solution, but for what is left of this Disunited Kingdom, it is probably the only way forward, and it may succeed in slackening the constitutional shackles like the House of Lords, some 800 has-beens who can collect £300 per day (tax free) for just popping in and travelling everywhere first class at our expense – this establishment also has 26 Church of England Bishops, nae Catholic Bishops, nor Jewish Rabbis nor Muslim Imams. We will dump that place after Independence, Labour have been promising to close it down for decades. As time moves on, but does not achieve anything, I came across a frightening item from the Conservative Home Site – yes they do have one! 75% of Tory members want a no deal Brexit – a hard one! In addition, 70% want Boris Johnston as the next Prime Minister. In the name of the wee man, are they all rich idiots? Or do they just wish to be idiots, and not aware that they will be poor idiots. Looking at this scenario, how could Scotland suffer another Tory Government? It is becoming clearer, and more urgent that the only way out for this country is to have independence – nothing less will do. The joking has to stop, and the clowns go back to the circus.